WHAT ARE THE DIFFERENT MODELS OF DATACARD ID CARD PRINTERS? CD800: single- or dual-sided ID badge printing with magnetic-stripe encoding and smart-card personalization, the best resolution available, and maximum productivity through better, more reliable performance and efficiency. 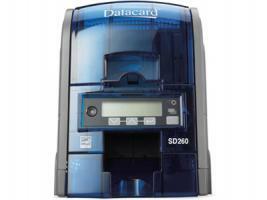 SD260: compact and easy-to-use, this single-sided printer offers fast and smooth high-quality card issuance. SD360: issue secure dual-sided badges on demand with this intuitive and high-performance card printer. SD460: dual-sided ID cards with advanced, reliable, tamper-resistant security features that can't be counterfeited or copied, including tactile impression, and a highly durable holographic overlay. WHICH FEATURES SHOULD I CONSIDER WHEN BUYING A DATACARD ID CARD PRINTER? Single vs. dual-sided: Single-sided Datacard ID card printers are designed to print on one side of a card while dual-sided models will automatically flip your cards to print on both sides in one pass. 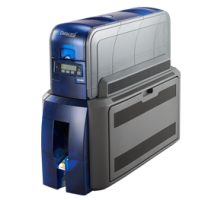 Card feeder vs. manual feeding: the SP25 Plus is a single-feed printer, perfect for card issuance on the spot. 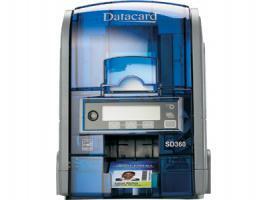 The SD260 comes with a manual feeder while all other Datacard ID card printers have a built-in card feeder. USB vs. Ethernet: All Datacard ID card printers come standard with USB and Ethernet, except the SP25 Plus. Basic vs. encoding options: if you need to print and encode data on magnetic or smart cards, opt for a card printer with the right encoder. All Datacard ID card printers offer optional encoding capabilities. Direct-to-card printing vs. retransfer: Datacard offers direct-to-card printers but for stunning print quality, retransfer ID card printers are also available. Retransfer Datacard ID card printers � SR200 and SR300 � provide unmatched print quality, even on uneven surfaces (proximity cards, smart cards, or pre-punched cards). Basic vs. lamination: the SP75 Plus includes a built-in lamination module and the SR200 and SR300 models come with optional single-sided lamination. Laminating your cards reduces the risk of counterfeiting and tampering while extending the lifespan of your cards. WHICH TYPE OF CARDS CAN I PRINT WITH DATACARD ID CARD PRINTERS? ID cards: print high-qualityID cards for your employees or students or issue highly-secure government credentials to identify every person at a glance. Time & attendance badges: your Datacard ID card printer allows you to track your employees, visitors or students and even print a schedule on the back of your cards with a dual-sided model.